Tricot Records gives us some insight to their favorite female artists. First of all, happy 2013! We all survived the apocalypse, which makes our previous Monday Mix a little irrelevant but still enjoyable. We apologize for taking the last couple of weeks off from writing - we've been busy with the holidays and adjusting to life at home during winter break (and watching ridiculous amounts of Homeland and Friday Night Lights, but that's just me). Second, we'd like to introduce a new mix series that will be included in our weekly Monday Mixes. We've asked some of our male friends who are involved with music to make a playlist of their favorite lady-centric music, including anything from nineties all-girl bands to female rappers, and tell us a little bit about why they chose these specific artists and tracks. 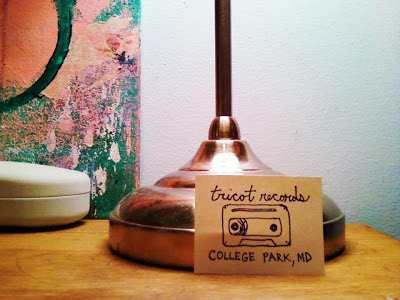 Our first mix of this series was created by Jack Stansbury, who's both a student at the University of Maryland and founder of cassette-based label Tricot Records. "I like women. My mom is a woman. Sometimes women have made me happy, and sometimes they've made me quite sad. This is a mix of some of my favorite songs made by women. Music scenes can be very male dominated. They often feel like a smellier version of a country club. Thank goodness female artists keep making awesome music and forcing themselves into the conversation. Please enjoy. Monday Mix: Tricot Records from thelesigh on 8tracks Radio. Check out Tricot Records here.